The hosts start the evening in second place but they will be looking to take top spot if they can. If Zenit win in the first game in Group C on the night then Bayern cannot take the top spot but if the Russians stumble, the way is open for the Germans to take control of the group. The away side travels with a 0-7 record and will be bowing out of the Eurocup on Wednesday night. In the earlier clash between these two sides, Bayern triumphed 44-68 and they’ll know that they have a better team that Budocnost. The hosts just need to show a good attitude and they should be able to get beyond their opponents with a bit to spare. Deven Booker has been at the forefront of Bayern’s points this season with an average of 12 points per game, but he is the only player on the German side that has scraped into double figures. It is no bad thing spreading the points around a team but the fact that not many Bayern players are hitting the heights with points indicates that they need to do more. 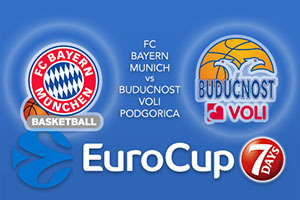 For Budocnost VOLI Podgorica, there will be a sense of relief at the end of this Eurocup season. 7 losses in a row, with every chance of an eighth coming this midweek, says all you need to know about their tools this season. Boris Savovic has provided an average of 12.7 points per game this season while Marcus Williams is also in double figures, offering an average of 12.3 points per game. If these two players turn up and put in a good performance, the Germans may be pushed hard but it is still likely that the away side will be returning home with nothing to show for their efforts. FC Bayern Munich should be in the mood here and you can take them at -17, which is on offer at odds of 1.90. When it comes to the Over/Under market, go UNDER 160.5 available at odds of 1.90. Bet Now!